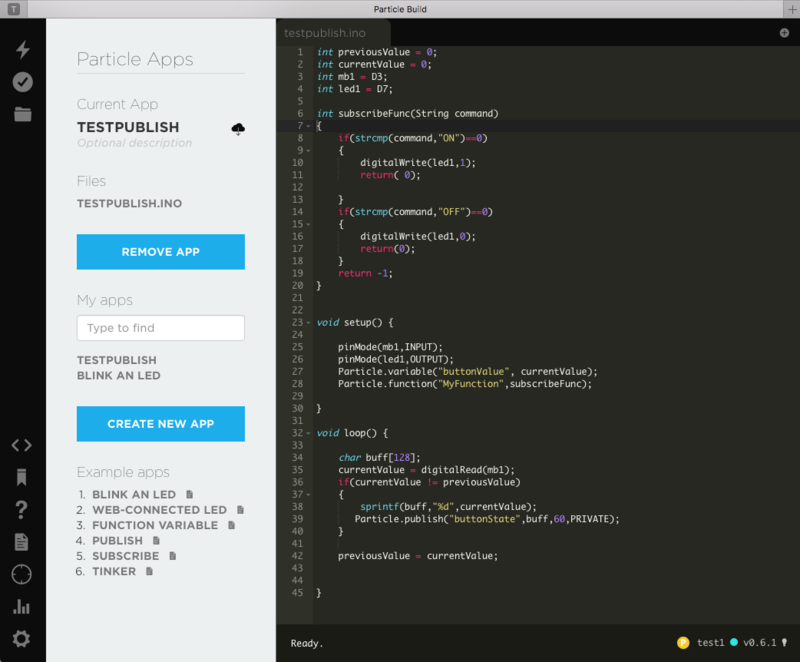 Particle makes two modules, called P0 ($10) and P1, ($12) which you can build into your system. 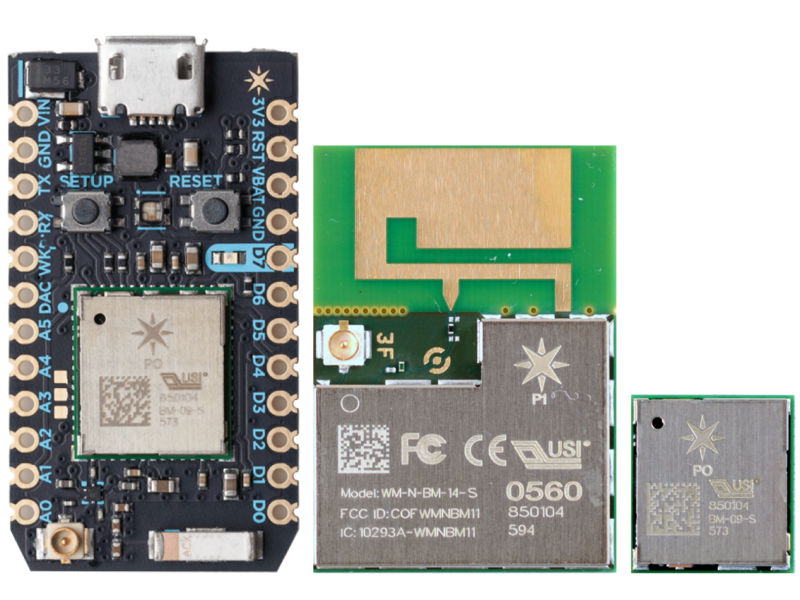 Both are FCC certified modules that use the Cypress 43362 WICED WiFi chip which is 2.4GHz 802.11a/b/g/n paired (unfortunately) with a STM MCU to run WICED & the Photon Environment. Both of the modules are PCB circuit boards with QFN style pads on the bottom that let you solder them into your system. The P0 is smaller (11mm x 12mm) but needs an antenna, and P1 is a bit bigger (28mm x 20mm) but has a PCB Antenna and SMA connector. Here is a picture which I borrowed from the Particle Website. The P0 is on the right, the P1 is in the middle, then on the left is a development kit with the P0 soldered into it. 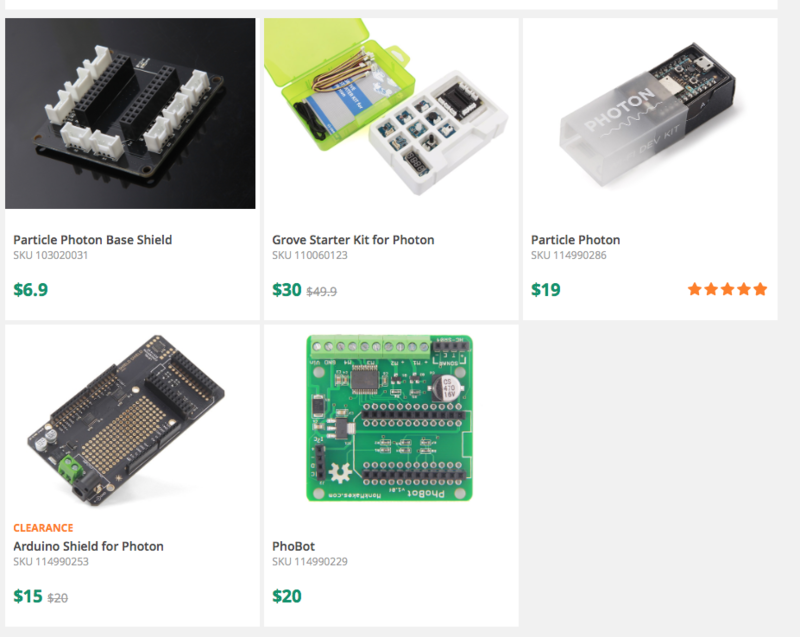 Photon makes essentially one basic development board (shown above on the left) as well as a bunch of different support boards and package deals. 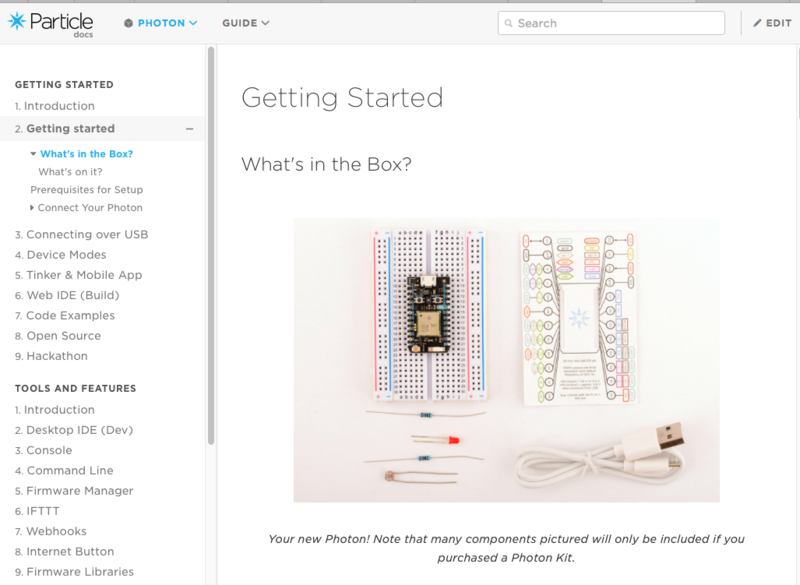 The basic development kit is $19 and has a Photon P0, an antenna, an SMA connector for an external antenna, two buttons (reset and setup), one user LED, a USB programming/power connector and 100 mil center pins with the P0 pins broken out. One very cool feature of the board is that the breakout pins are castellated on the side of the board so that you could solder it directly into your product. 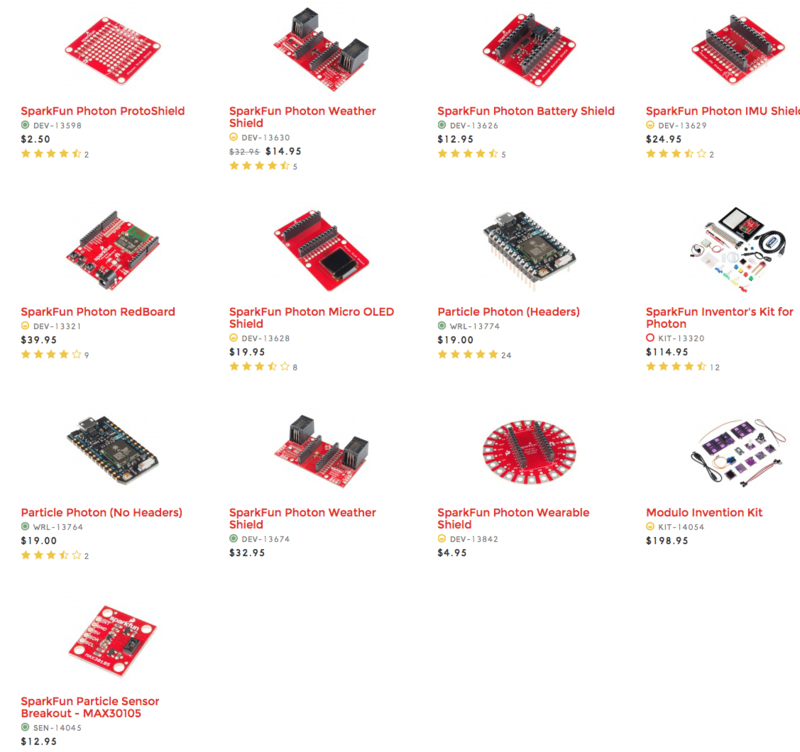 In addition there are several other makers of support boards including SparkFun, Adafruit and SeeedStudio. 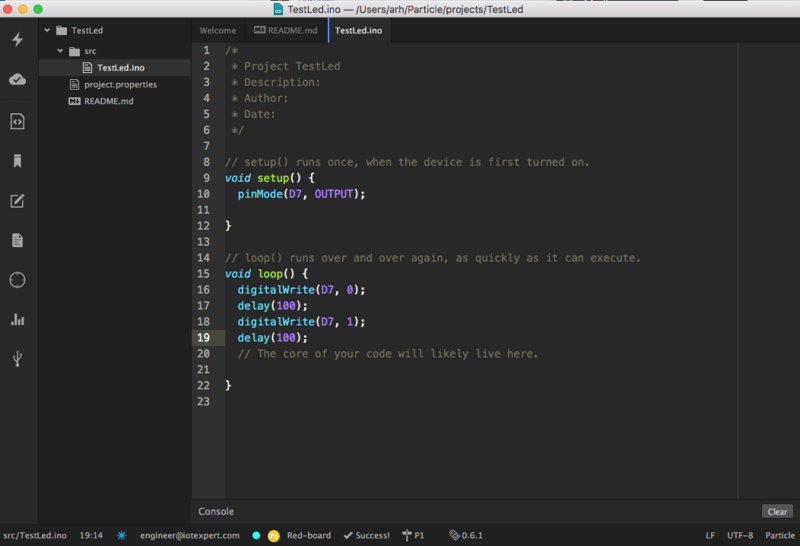 Particle offers two integrated development environments, one web based and one computer client based on Atom. Both are approximately Arduino clones… and both work very well. The web based environment includes a code editor, compiler, over-the-air flash utility. and library utility. Here is screenshot of one of the programs that I was working on. And the desktop environment, which works on Windows, Mac and Linux, is very well integrated and “feels” just like the web environment. I was amazed that as soon as I installed the tool it was connected to the Particle Cloud and to my devices. I created a very simple blink the led program. After I pressed the lightning bolt… 15 seconds later my board was bootloaded over the air. Here is a screenshot from my Mac. There are two sets of command line tools that you can use to interact with the Photons, dfu-util and the Particle-cli. The first is “dfu-util” which I didn’t know anything about until I started using the Photons. 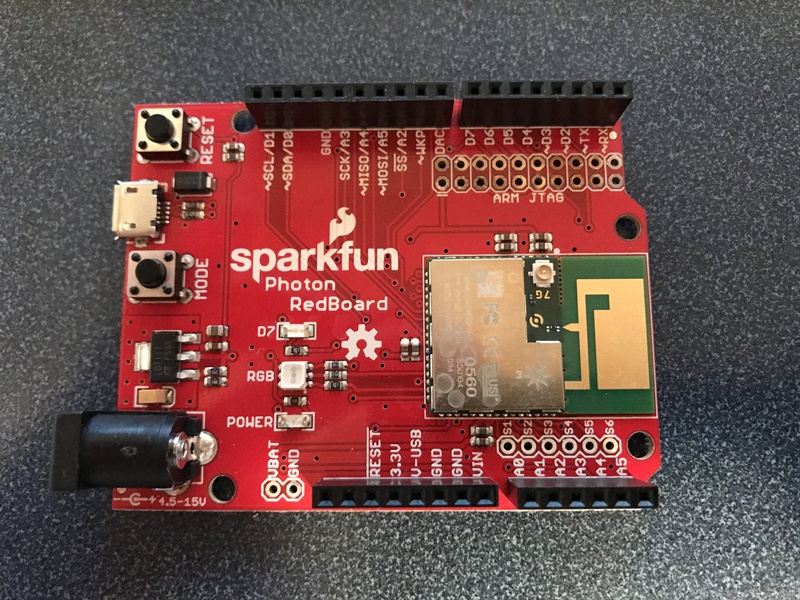 DFU-UTIL is a USB bootloader host that allows you to update sections of the Photons firmware. When I took my boards out of the box they had very old system firmware and things were not connecting correctly. I ended up having to download new system firmware and then install it on the boards. The instructions were on this website. 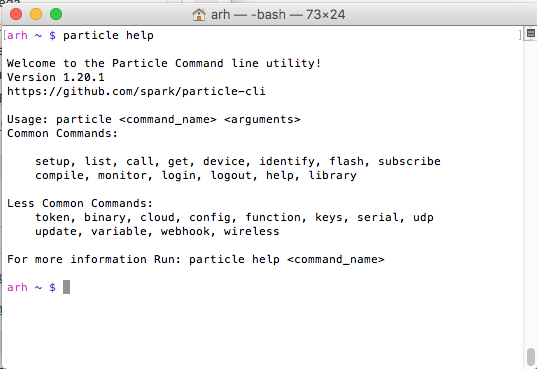 The second tool, called the Particle Command Line Interface is also really cool. Once you install it you can upgrade firmware, send commands, read and write data, call functions etc on your devices. The bottom line is the documentation is outstanding, something that is a rare and wonderful thing in the business. You can find it on their website. Here is a screenshot of the first page. 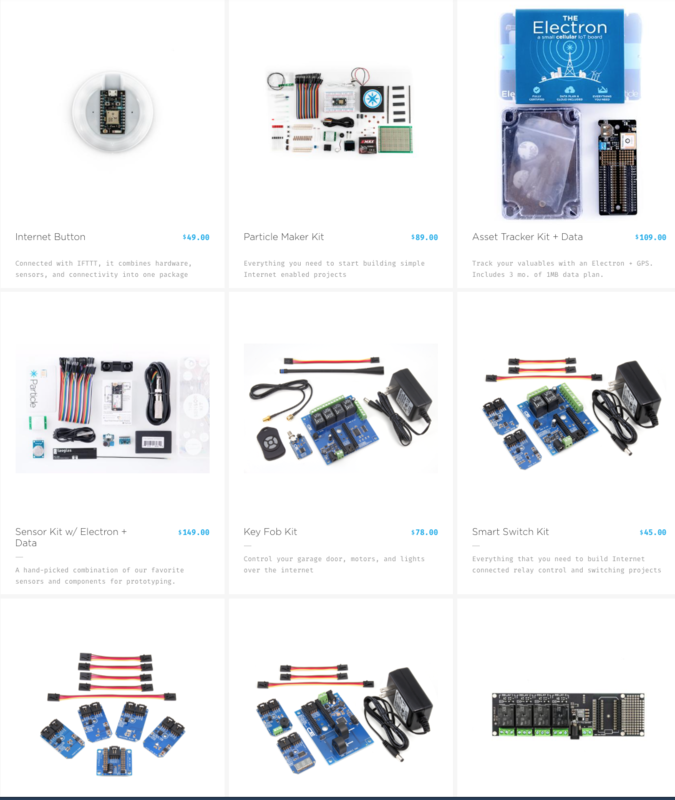 There is a free tier for makers and experiments which includes up to about 25 devices and 250K transactions per month. Beyond that they have several subscription levels. In the screen shot below you can see my two devices (one called “Red-board” and one called “test1”). 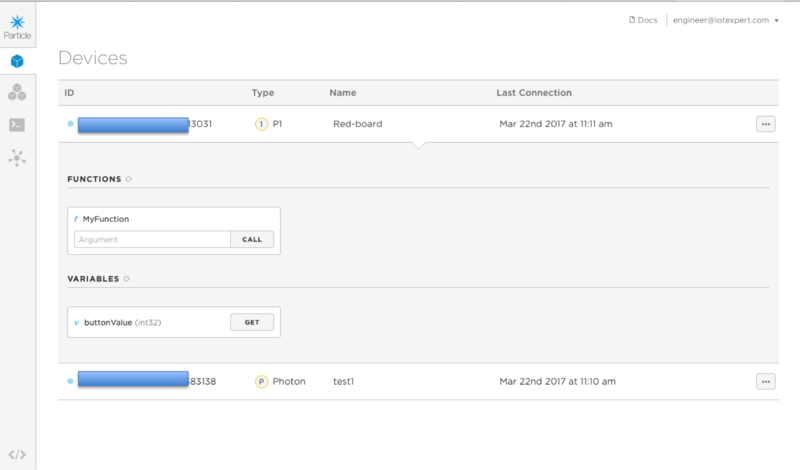 With this interface I can query the device and run “functions” which are like remote procedure calls. 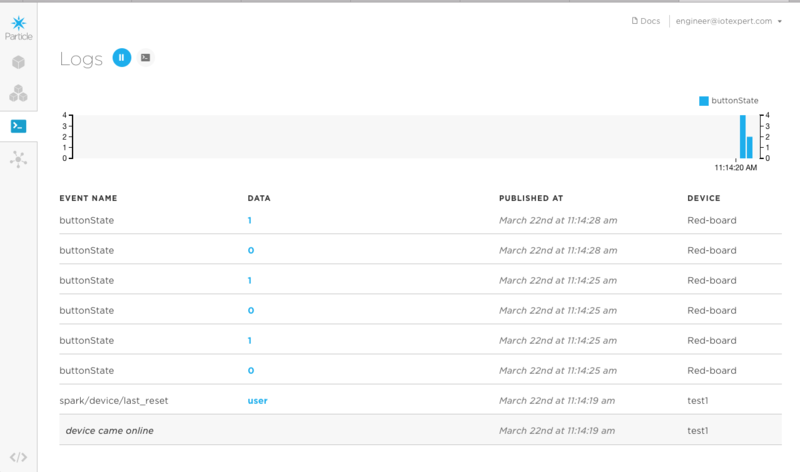 In the console log you can see all of the events pertaining to your device. In the screenshot below you can see that I changed the state of the button a bunch of times on the “Red-board”. You can also see where the “test1” board was reset and re-attached to the network. In the next Particle post I will make something…. what? Im not sure yet. But Ill think of something.